During my time at Impakt as an artist-in-residence, I have been working on a new project called EquityBot, which is an online commission from Impakt. It fits well into the Soft Machines theme of the festival: where machines integrate with the soft, emotional world. What is EquityBot? Many people have asked me that question. EquityBot is a stock-trading algorithm that “invests” in emotions such as anger, joy, disgust and amazement. It relies on a classification system of twenty-four emotions, developed by psychologist and scholar, Robert Plutchik. During stock market hours, EquityBot continually tracks worldwide emotions on Twitter to gauge how people are feeling. In the simple data-visualization below, which is generated automatically by EquityBot, the larger circles indicate the more prominent emotions that people are Tweeting about. At this point in time, just 1 hour after the stock market opened on October 28th, people were expressing emotions of disgust, interest and fear more prominently than others. During the course of the day, the emotions contained in Tweets continually shift in response to world events and many other unknown factors. EquityBot then uses various statistical correlation equations to find pattern matches in the changes in emotions on Twitter to fluctuations in stocks prices. The details are thorny, I’ll skip the boring stuff. My time did involve a lot of work with scatterplots, which looked something like this. Once EquityBot sees a viable pattern, for example that “Google” is consistently correlated to “anger” and that anger is a trending emotion on Twitter, EquityBot will issue a BUY order on the stock. Conversely, if Google is correlated to anger, and the Tweets about anger are rapidly going down, EquityBot will issue a SELL order on the stock. EquityBot runs a simulated investment account, seeded with $100,000 of imaginary money. In my first few days of testing, EquityBot “lost” nearly $2000. This is why I’m not using real money! Disclaimer: EquityBot is not a licensed financial advisor, so please don’t follow it’s stock investment patterns. The project treats human feelings as tradable commodities. It will track how “profitable” different emotions will be over the course of months. As a social commentary, I propose a future scenario that just about anything can be traded, including that which is ultimately human: the very emotions that separate us from a machine. If a computer cannot be emotional, at the very least it can broker trades of emotions on a stock exchange. As a networked artwork, EquityBot generates these simple data visualizations autonomously (they will get better, I promise). It’s Twitter account (@equitybot) serves as a performance vehicle, where the artwork “lives”. Also, all of these visualizations are interactive and on the EquityBot website: equitybot.org. I don’t know if there is a correlation between emotions in Tweets and stock prices. No one does. I am working with the hypothesis that there is some sort of pattern involved. We will see over time. The project goes “live” on October 29th, 2014, which is the day of the opening of the Impakt Festival and I will let the first experiment run for 3 months to see what happens. Feedback is always appreciated, you can find me, Scott Kildall, here at: @kildall. https://kildall.com/wp/wp-content/uploads/2019/02/logo-1.png 0 0 Scott Kildall https://kildall.com/wp/wp-content/uploads/2019/02/logo-1.png Scott Kildall2014-10-28 14:55:452014-10-28 14:55:45EquityBot goes live! It’s been a busy couple of weeks working on the EquityBot project, which will be ready for the upcoming Impakt Festival. Well, at least some functional prototype in my ongoing research project will be online for public consumption. The good news is that the Twitter stream is now live. You can follow EquityBot here. 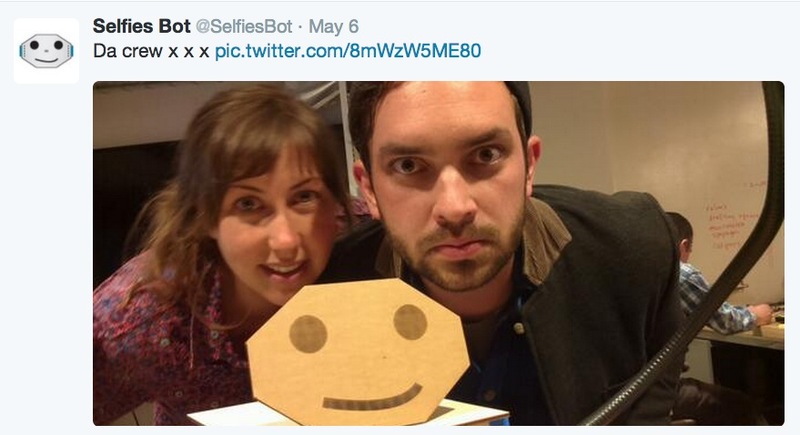 EquityBot now tweets images of data-visualizations on its own and is autonomous. I’m constantly surprised and a bit nervous by its Tweets. Using code from Jim Vallandingham, In just one evening, I created dynamically-generated bubble maps of Twitter sentiments as they arrive EquityBot’s own sentiment analysis engine. I mapped the colors directly from the Plutchik wheel of emotions, which is why they are still a little wonky like the fact that the emotion of Grief is unreadable. Will be fixed. I did some screen captures and put them my Facebook and Twitter feed. I soon discovered that people were far more interested in images of the data visualizations than just text describing the emotions. I ended up using PhantomJS, the Selenium web driver and my own Python management code to solve the problem. There biggest hurdle was getting Google webfonts to render properly. Trust me, you don’t want to know the details. But I’m happy with the results. EquityBot will now move to other Tweetable data-visualizations such as its own simulated bank account, stock-correlations and sentiments-stock pairings. For my latest project, EquityBot, I’ve been researching, building and writing code during my 2 month residency at Impakt Works in Utrecht (Netherlands). The initial code-work has involved configuration of a back-end server that does many things, including “capturing” Twitter sentiments, tracking fluctuations in the stock market and running correlation algorithms. I know, I know, it sounds boring. Often it is. After all, the result of many hours of work: a series of well-formatted JSON files. Blah. But it’s like building city infrastructure: now that I have the EquityBot Server more or less working, it’s been incredibly reliable, cheap and customizable. 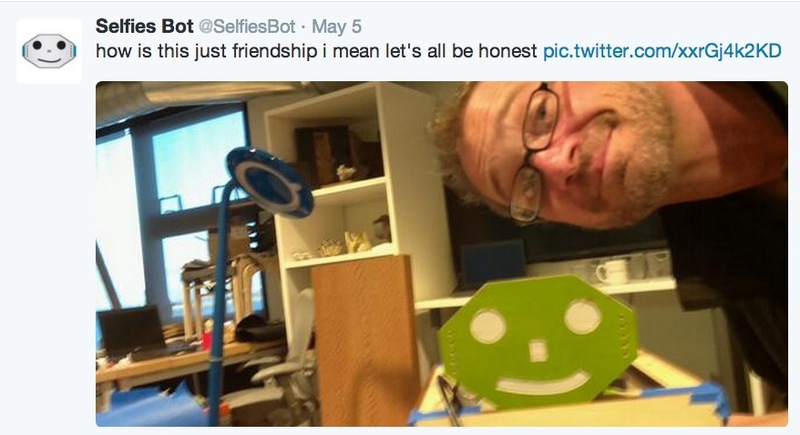 It can act as a Twitterbot, a data server and a data visualization engine using D3. This type of programming is yet another skill in my Creative Coding arsenal. And consists of mostly Python code that lives on a Linode server, which is a low-cost alternative to options like HostGator or GoDaddy, which incur high monthly costs. And there’s a geeky sense of satisfaction in creating a well-oiled software engine. The EquityBot Server looks like a jumble of Python and PHP scripts. I cannot possibly explain it excruciating detail, nor would anyone in their right mind want to wade through the technical details. Instead, I wrote up a blueprint for this project. For those of you who are familiar with my art projects, this style of blueprint may look familiar. I adapted this design from my 2049 Series, which are laser-etched and painted blueprints of imaginary devices. I made these while an artist-in-residence at Recology San Francisco in 2011. This summer, I’m working on a Creative Code Fellowship with Stamen Design, Gray Area and Autodesk. The project is called Water Works, which will map and data-visualize the San Francisco water infrastructure using 3D-printing and the web. Finding water data is harder than I thought. Like detective Gittes in the movie Chinatown, I’m poking my nose around and asking everyone about water. Instead of murder and slimy deals, I am scouring the internet and working with city government. I’ve spent many hours sleuthing and learning about the water system in our city. The Sewer System is owned and operated by the SFPUC. The DPW provides certain engineering services. This is a combined stormwater and wastewater system. Yup, that’s right, the water you flush down the toilet goes into the same pipes as the the rainwater. Everything gets piped to a state-of-the art wastewaster treatment plant. Amazingly the sewer pipes are fed almost entirely by gravity, taking advantage of the natural landscape of the city. The Auxiliary Water Supply System (AWSS) was built in 1908 just after the 1906 San Francisco Earthquake. It is an entire water system that is dedicated solely to firefighting. 80% of the city was destroyed not by earthquake itself, but by the fires that ravaged the city. The fires rampaged through the city mostly because the water mains collapsed. Just afterwards, the city began construction on a separate this infrastructure for combatting future fires. It consists of reservoirs that feed an entire network of pipes to high-pressure fire hydrants and also includes approximately 170 underground cisterns at various intersections in the city. This incredible separate water system is unique to San Francisco. The Potable Water System, a.k.a. drinking water is the water we get from our faucets and showers. It comes from the Hetch Hetchy — a historic valley but also a reservoir and water system constructed from 1913-1938 to provide water to San Francisco. This history is well-documented, but what I know little about is how the actual drinking water gets piped into San Francisco. homes Also, the San Francisco water is amongst the most safe in the world, so you can drink directly from your tap. Given all of this, where is the story? This is the question that I asked folks at Stamen, Autodesk and Gray Area during a hyper-productive brainstorming session last week. 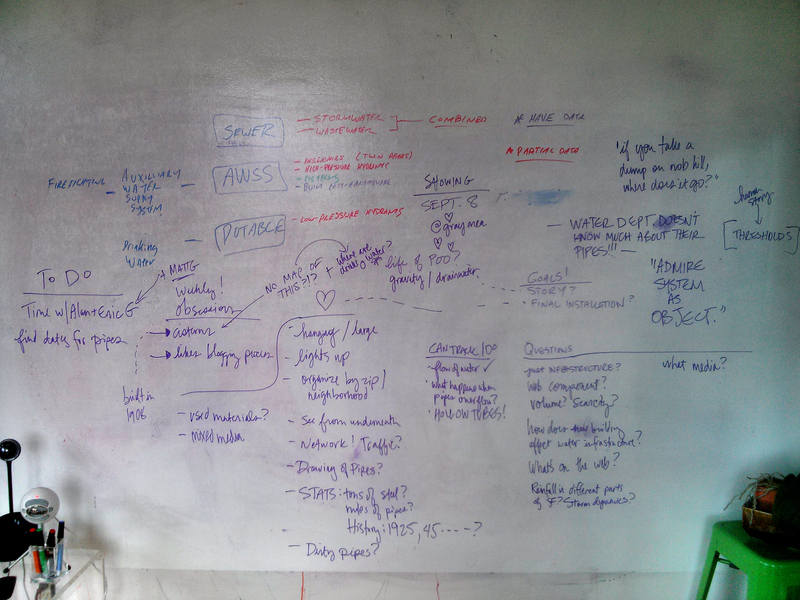 Here’s the whiteboard with the notes. The takeaways, as folks call it are, are below and here I’m going to get nitty-gritty into process. (1) In my original proposal, I had envisioned a table-top version of the entire water infrastucture: pipes, cisterns, manhole chambers, reservoirs as a large-scale sculpture, printed in panels. It was kindly pointed out to me by the Autodesk Creative Projects team that this is unfeasible. I quickly realized the truth of this: 3D prints are expensive, time-consuming to clean and fragile. Divide the sculptural part of the project into several small parts. (2) People are interested in the sewer system. Someone said, “I want to know if you take a dump at Nob Hill, where does the poop go?” It’s universal. Everyone poops, even the Queen of England and even Batman. It’s funny, it’s gross, it’s entirely human. This could be accessible to everyone. (3) Making visible the invisible or revealing what’s in plain sight. The cisterns in San Francisco are one example. Those brick circles that you see in various intersections are actually 75,000 gallon underground cisterns. Work on a couple of discrete urban mapping projects. 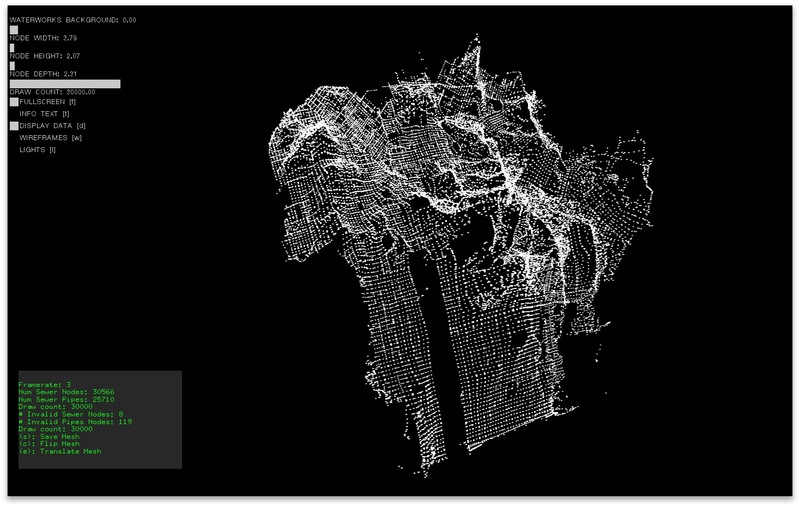 (4) Think about focusing on making a beautiful and informative 3D map / data-visualization of just 1 square mile of San Francisco infrastructure. Hone on one area of the city. (5) Complex systems can be modeled virtually. Over the last couple weeks, I’ve been running code tests, talking to many people in city government and building out an entire water modeling systems in C++ using OpenFrameworks. It’s been slow, deliberate and arduous. Balance the physical models with a complex virtual one. I’m still not sure exactly where this project is heading, which is to be expected at this stage. For now, I’m mining data and acting as a detective. In the meantime, here is the trailer for Chinatown, which gives away the entire plot in 3 minutes. The last week has been a flurry of coding, as I’m quickly creating a crude but customized data-3D modeling application for Water Works — an art project for my Creative Code Fellowship with Stamen Design, Gray Area and Autodesk. This project build on my Data Crystals sculptures, which transform various public datasets algorithmically into 3D-printable art objects. For this artwork, I used Processing with the Modelbuilder libraries to generate STL files. It was a fairly easy coding solution, but I ran into performance issues along tje wau. But Processing tends to choke up at managing 30,000 simple 3D cubes. My clustering algorithms took hours to run. Because it isn’t compiled into machine code and is instead interpreted, it has layers of inefficiency. I bit the coding bullet and this week migrated my code to OpenFrameworks (an open source C++ environment). I’ve used OF before, but never with 3D work. There are still lots of gaps in the libraries, specifically the STL exporting, but I’ve had some initial success, woo-hoo! Here are all the manholes, the technical term being “sewer nodes”, mapped into 3D space using GIS lat/lon and elevation coordinates. The clear indicator that this is San Francisco, and not Wisconsin, which this mapping vaguely resembles is the swath of empty space that is Golden Gate Park. What hooked me was that “a-ha” moment where 3D points rendered properly on my screen. I was on a plane flight home from Seattle and involuntarily emitted an audible yelp. Check out the 3D mapping. There’s a density of nodes along the Twin Peaks, and I accentuated the z-values to make San Francisco look even more hilly and to understand the location of the sewer chambers even better. Sewer nodes are just the start. I don’t have the connecting pipes in there just yet, not to mention the cisterns and other goodies of the SF water infrastructure. Of course, I want to 3D print this. By increasing the node size — the cubic dimensions of each manhole location, I was able to generate a cohesive and 3D-printable structure. This is the Meshlab export with my custom-modified STL export code. I never thought I’d get this deep into 3D coding, but now, I know all sorts of details, like triangular winding and the right-hand rule for STL export. 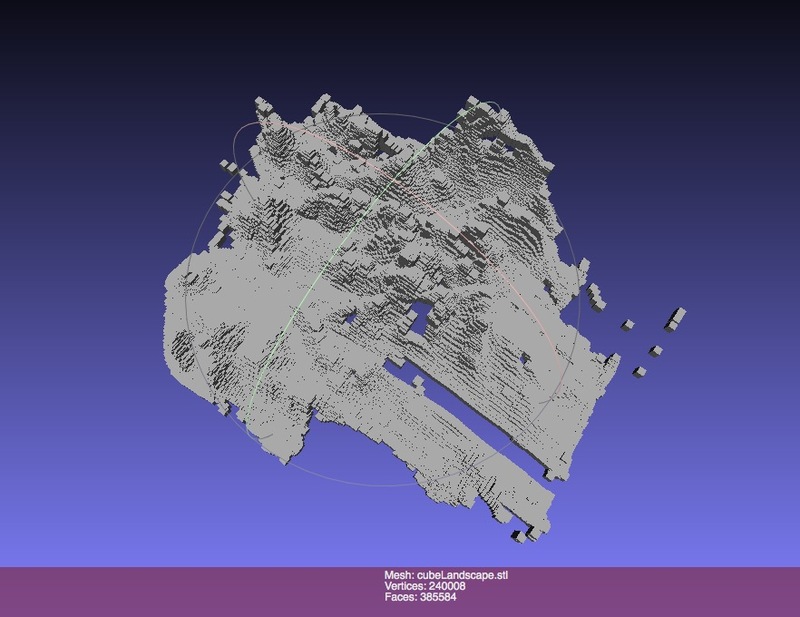 And here is the 3D print of the San Francisco terrain, like the Data Crystals, with many intersecting cubes. It doesn’t have the aesthetic crispness of the Data Crystals project, but this is just a test print — very much a work-in-progress. I’ve fallen a bit behind in my documentation and have a backlog of great stuff that I’ve been 3D-printing. These are a few of my early tests with my new project: Data Crystals. I am using various data sources, which I algorithmically transform data into 3D sculptures. The source for these is the San Francisco Open Data Portal — which provides datasets about all sorts of interesting things such as housing permit data, locations of parking meters and more. 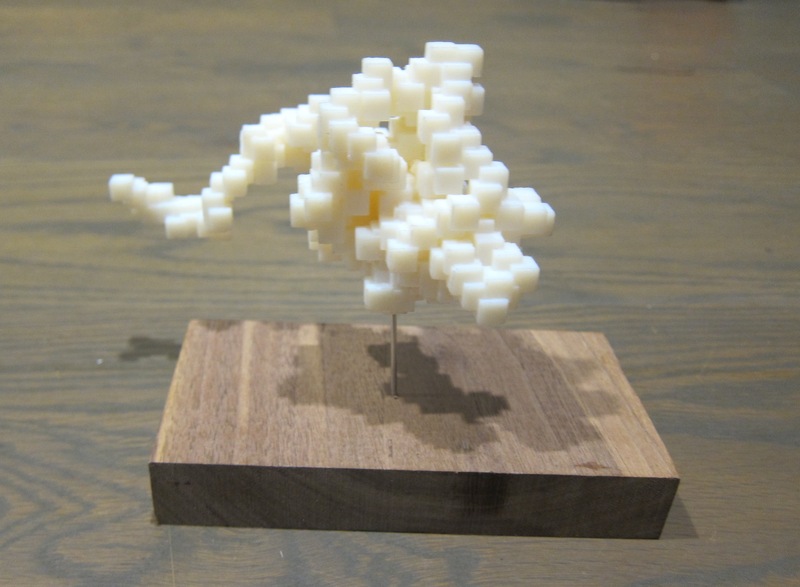 My custom algorithms transform this data into 3D sculptures. Legibility is still an issue, but initial tests show the wonderful work that algorithms can do. This is a transformation of San Francisco Crime Data. It turns out that crime happens everywhere, so the data is in a giant block. After running some crude data transformations, I “mined” this crystal: the location of San Francisco public art. Most public art is located in the downtown and city hall area. But there is a tail, which represents the San Francisco Airport. More experiments: this is a test, based on the SF public art, where I played with varying the size of the cubes (this would be a suggested value of artwork, which I don’t have data for…yet). Now, I have a 4th axis for the data. Plus, there is a distinct aesthetic appeal of stacking differently-sized blocks as opposed to uniform ones.